Often trails will have communal bowls, but when you're halfway up the mountain and your dog starts to pant a little too heavily, you'll be glad they have their own bowl to slurp out of! There's a Water Wallet, which folds up the smallest and comes with a handy clip. Rubber pop-out bowls like these ones from Messy Mutt are easy to clean. Dog water bottles let you store the water and serve it in one convenient bottle. We all know it is important to clean a wound before covering it, that goes for animals as well as humans. We went over three of our favourite wound cleaning solutions in a previous post. 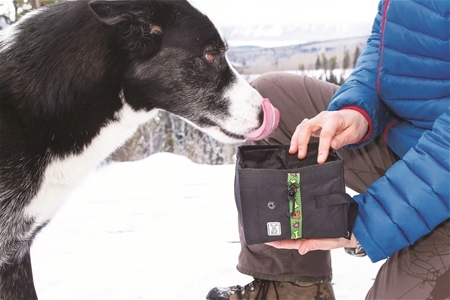 Vet wrap is a key feature in any dog first aid kit. 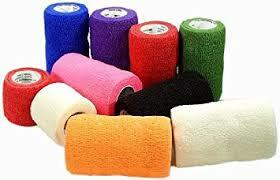 It is self-adherent tape that won't stick to skin or fur, and no need for any clips. It is porous so the wound can breathe while you apply pressure, and is flexible enough to fit around any of those odd angles. For open wounds, you can use the cotton pads in your human first aid kit, and wrap it tightly with vet wrap to prevent blood loss. If you suspect a strain but can't find an open cut, the vet wrap can go directly on the limb to provide support. And yes, you can use vet wrap on yourself too! Now we turn the conversation over to you! Do you keep any special items with you for those just-in-case moments?